The index opened gap-up and went up to touch new all time high at 8627, but saw huge profit booking to move to the lows around 8526. A pullback towards the end saw the index close in the green at 8564.40, gain of 26.75 points. The broader market was just positive, with 802 advances to 718 declines. Range for Nifty as per OI Table comes to 8400-8700. 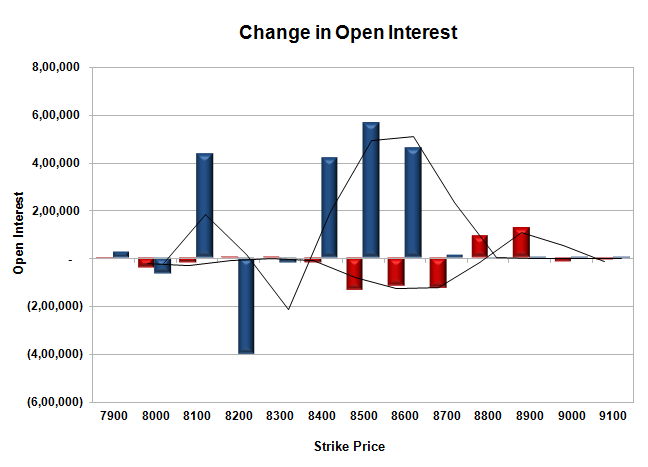 Call option 8800-8900 added 2.21 lacs OI with short covering seen at 8500 and lower strike prices. Put option 8600-8400, 8100 added huge 18.81 lacs OI with profit booking seen at 8300 and below strike prices. Nifty Open Interest is at 1,98,97,575 down by 6,19,975, with increase in price, probably huge short covering/long liquidation. 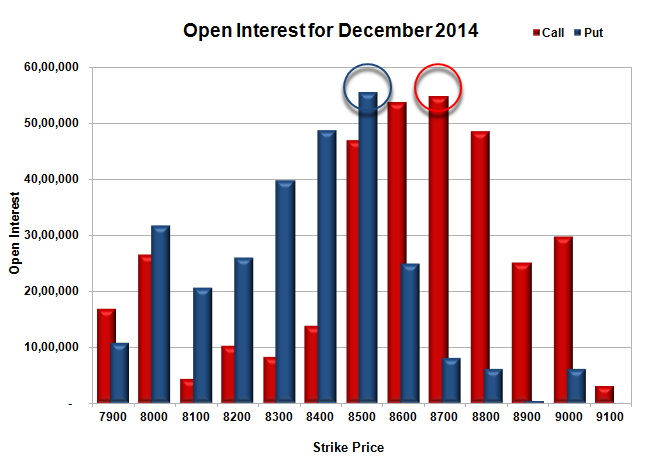 Bank Nifty Open Interest is at 18,78,475 up by 10,050, with increase in price, probably long build-up. FII’s sold huge 8.06 lacs Futures, which includes 24370 contracts long liquidation and 7879 contracts short build-up, with decrease in net OI by 16491 contracts (includes 22714 longs to 54963 shorts for the day) and the Average Price comes to 8808.82. FII’s Index future open contract as on date is 605859 Longs to 75320 Shorts, net long 530539 down by 32249 contracts. Initial and best support at 8500, with highest OI of 55.61 lacs and below that at 8400 with OI of 48.78 lacs. Initial resistance still at 8600, with OI of 53.75 lacs and above that at 8700 with huge OI of 54.85 lacs. 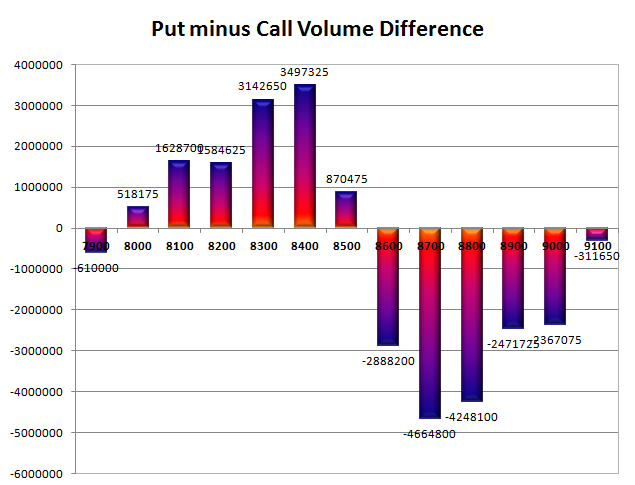 Day Range as per Option Table is 8514 - 8626 and as per VIX is 8509 - 8620 with 8573 as the Pivot.